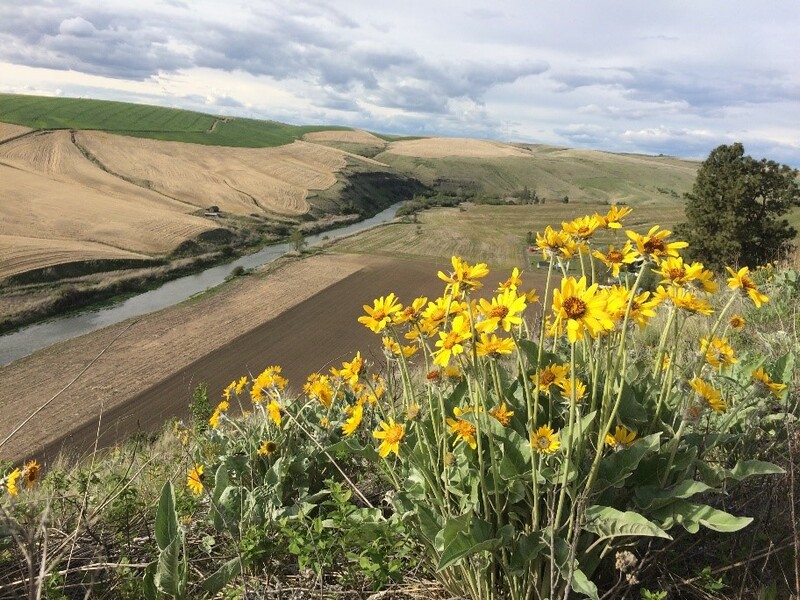 This week’s post is a photo montage of recent scenes from Palouse Colony Farm where we were treated to an moist spring that benefited both crops and the native flora of the area’s river bluffs and natural grasslands. Bursts of yellow “sunflower” balsamroot (Balsamorhiza careyana )abound on the southwestern facing slopes while purple lupine (Lupinus spp. ), and other wildflowers favor the longer shadows of northern hillsides. The nutritious seeds and stalks of the sunflowers have long been gathered by the region’s native peoples, while lupine blossoms served as a traditional grave decoration. While elk have been known to frequent the canyon some miles upstream, this is the first year in memory that a small herd of about fifteen of these grand creatures lingered in the vicinity of Palouse Colony Farm. By winter they had headed eastward probably to range in the higher elevations of northern Idaho but we hope they remember the way back to our vicinity. Our bend in the river, which is the northernmost point of the Palouse, has also been home this spring to two pairs of nesting bald eagles. The males periodically swoop high above us when walking around the farm as if to make sure we’re tending to the business of the farm and check out the river for any fish that might be moving close to the surface. I always marvel at how well our landrace winter grain varieties mature in the spring after looking so scrawny in the fall. One wonders how Mother Nature equips the delicate leaves of the young plants to withstand the subzero temperatures that frequently descend throughout the region in December and January. Our father, who raised bountiful crops year after year on our family’s acreage just east of Palouse Colony Farm, observed that the first two weeks of February brought more frost damage to the crops than any other period during the winter. The pictures below show two of our grandchildren standing between stands of Crimson Turkey hard red bread wheat (at left) and soft red Yellow Breton, one of France’s famed crepe grains. The contrast between the sparsely filled furrows last November with the lush stand at the same place in June attests to the remarkable life-giving forces of land and air.